My head is swimming with the details (and chords and lyrics) for our Benefit Concert scheduled for tomorrow night. There is some snow forecast (darn you, Mother Nature!) but I think we should be OK for the concert. It would be a pain to cancel and reschedule, given the number of acts of student and staff musicians on hand. (The Concert is raising money for Pennies for Peace and book donations for schools in New Orleans). Yesterday, I was so happy because our librarian, Pati, agreed to sing my Haiti song for the concert and we practiced a bit yesterday. She has a lovely voice and I am excited to use a new song for the event. I hope to enlist a student to run my videocamera, so we can create a video of the event. We’ll see .. I was in our downtown over the weekend with my son, celebrating a great report card with a lunch at his favorite place to eat. Nearby, I noticed a store that I used to go to all the time. It is an eclectic used CD store. I used to browse through and almost always come out with something. Not anymore, I realized, and although I felt the pull to head in there after lunch, I resisted. What would I do with a new CD? I only use an MP3 player for music in the house now. I felt sad about this and it reminded me of the transition from vinyl to CD (but I don’t miss 8-track days). But the reality is that I have a collection of discs that I never even look at. Their time has come and gone. I did buy a new album this weekend by an artist named James Maddock. That path I took was interesting: I was reading Paste Magazine, which has barely survived the tumult of the magazine world but remains a favorite of mine, and flipping through the music reviews. I saw an advertisement and read through some of the claims of “best album of 2009” and more. Hmmm. In the past, I would have written a note and put it in my wallet for the future. Maybe I would stumble upon the album. Maybe not. Not now. Now, I jumped on my computer and headed over to LaLa, a music site, where I searched for James Maddock, and listened to a few cuts from the album that was getting such praise. Nice, I thought. I pulled out my iPod touch, connected to iTunes, downloaded the album and in about ten minutes, the house was alive with the music of James Maddock. That is the digital revolution when it comes to music. The Class: must-see video tv? If you, like me, love The Office, then you have to see this funny knock-off called The Class, which pokes great fun at the teacher trying to “catch up” to the students when it comes to using technology. Yeah, he’s clueless. This is great stuff. I’ll admit it: I was worried that folks were either against alliteration or losing interest in Days in a Sentence this week (or just plain did not have the time). On Friday, I had just two people send in a sentence (thanks Bonnie and Jim — and you can hear Jim podcast his sentence over at Vocaroo). So, I sent out a reminder to our email group and lo and behold, I ended up with 17 responses. Thank you to everyone! I didn’t go to Educon 2.2 but I followed from afar. This video — which was a link in a tweet — is an interview with students at the conference. We need more student voices in the mix. Sometimes, you just stumble upon a gem and that was the case this week with the book written by Kate Klise and i llustrated by M. Sarah Klise called Regarding the Fountain. I found it on a shelf in our library, thinking it might be right for one of my students, but during some quiet reading times in class, I opened it up and was hooked. The subhead gives you a clue as to what is in store: “A Tale in Letters, of Liars and Leaks.” Yes, the book is full of puns, so be warned. The book tells the story of a town where the main river dried up thirty years prior when a new school was constructed. In the current time, the school water fountain has gone kaput and the principal wants to hire someone to design and install a new water fountain. He gets more than he bargains for when he contacts Florence Waters, who has a spirit and vision all of her own, and she enlists a fifth grade class to help her. Meanwhile, the kids uncover a mystery about what happened to the river. And the entire novel is told entirely through letters, memos and notes. I loved how Klise makes you read between so many lines (just when you think the teacher is proposing marriage to Waters, you learn this is not the case at all, and that makes you chuckle at your own assumptions), and infer what is happening that has not been written. She injects so much humor, too (the communications between Waters the designer and the principal are priceless). And she empowers the kids at the school, who write an opera, dress up in elaborate costumes and play with the two pet monkeys she has sent them from Africa. There’s more, but you get the point. This small book (check out part of it at Google Books) is a great example of non-traditional text and as we think about ways to use digital media to tell stories — through hyperlinks, videos, audio tracks, etc. — it is useful to be reminded that words in a linear sentence is not the only way to tell a story and engage a reader. It reminds me of a story I once wrote that was told exclusively through the concept of canceled checks. You leave out as much as you put in, hoping that the reader can fill in the gaps of the story. I see that Klise also has other books like this one out, including Regarding the Trees: A Splintered Saga Rooted in Secrets and Regarding the Bathrooms: a Privy to the Past. Don’t you just love coming across a new book series or author? That makes my day. I might need to create a glog about this book for my students. 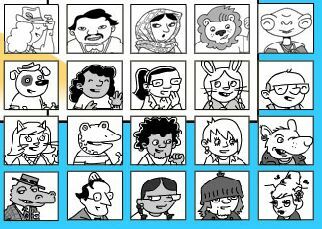 Bill Zimmerman’s Make Beliefs Comix site is one that I suggest teachers use if they are interested in having their students create webcomics. It is a site that is easy to use, is cute and kids get it right away. Bill just added a handful of new characters to the site and also added objects to be used in the comics. And I want to point out that the site is also a good resource for Second Language or ELL instruction, as you can compose in English, Spanish, Portuguese, Latin, German or French. Pretty neat. I wrote a few weeks ago about a meeting that some of us had in our school district around angling technology towards the center of the identity of our school district. I kept thinking about it and worried that if no one followed up on the meeting, the whole idea would just sputter out to nothing. There is still that possibilities, but I wrote down my own ideas for the school district administration and shared them this week on an Etherpad document, urging the principals and superintendents to collaborate on it (nothing yet). Goals: How we do make our use of technology in the Hampshire Regional Schools more visible to the public (inside and outside of Hampshire Regional) and continue to integrate meaningful technology into the classrooms? Rationale: We have invested, and continue to invest, significant funds into technology purchases in our school district. We “earn” significant money from School of Choice students electing to come here but we also lose significant funds from our students going elsewhere, too. By branding our district as one that is infused with technology and innovation, we have the opportunity to create an identity as a district that is preparing students for the world of the future. Beyond the marketing concept, the creation of this identity might help more teachers take the first steps into using technology in meaningful ways because they want to identify with the goals of the district. Finally, this shift might open the door for more grant opportunities for our district, as most organizations want to see the groundwork already in place before handing out money. Better public relations: Contact newspapers about technology-infused projects that showcase student engagement. Don’t be afraid of the press. Reporters love an easy story, and technology is still flashy for the newspapers. And if they can see kids doing something, creating something — that is even better. Make the reporter’s life easier by getting everything set up and ready for them, and positive stories will get written. School websites — There should not be a single empty webpage on any of our sites. At the very least, every teacher should have a headshot and a welcome message. An overview of their curriculum would be helpful, too. And any sample projects gives more content to a site. An empty page sends a message that the school is not yet made its way into the 21st Century. Remember: for some teachers, even this step is difficult, but we need to create the illusion at least that we are all tech-savvy. A unified technology mission statement: It would be nice to have some district-wide mission statement around our views of technology. In my view, the statement needs to be student-centered (remember, our audience is parents here) and engagement with technology for meaningful reasons that enhance our curriculum and prepare students for a world that does not yet exist. The tools are not nearly as important as the students. I suggest we also create a short, five-minute video documentary of technology in our district that could be placed front and center at our district website and perhaps even on our individual school websites. It could showcase some student projects, some teachers talking about technology integration and give a flavor of some of the work going on. Quality will be the key here. What about an App? I know this is a stretch, but some schools are starting to develop an App for iTunes that provides a feed of news from a school district. (see this article: http://www.billingsmiddleschool.org/beta/2010/01/20/billings-middle-school-iphone-app-released/) Even if the response is not overwhelming, a Hampshire Regional School District App puts the notion out there that our district is leap-years ahead of other school districts. Of course, then there is the issue of who would be responsible for putting news out there. We don’t want a dead App like we have dead Webpages. Family Technology Night: Given the rise emerging technologies, it might make sense to have a night for families to come in to our schools and use the technology themselves. We could have parents and students work on a digital story together, for example. It would also provide yet another opportunity to talk about the pros and cons of kids and technology — a realistic view that technology is not the answer, but another tool for engagement. Create a database/collection of successful technology: We know colleagues are using technology but we never get a chance to share or learn from each other. Why not find a simple (ease of use is key here) to collect ideas, lesson plan ideas, websites and contacts from within our district where folks are doing these ideas. We make our teachers the leaders. Sharing tools/resources: This is similar to the last item. If there are resources out there that are useful, let’s share them with each other. What have my colleagues used that has been successful? Technology coach/partner: This is a critical piece of the puzzle here. In my experience, there is a group of teachers who may never see the value of technology, and there is a group of teachers who are doing all they can to use technology. It’s the middle group that we want to make the shift — they see the value, but are not ready to do it on their own. We need to find a way to create partnerships or have technology coaches (like a literacy coach) to work with teachers in their classrooms for an extended period of time to plan and implement technology integration into the curriculum. Technology Across the Curriculum — Teachers need to know that technology is a tool for any curriculum area. It is not a drop-off class, or some enrichment activity for high-achieving students. Technology can have a place in science, in social studies, in math and more. And this technology across the curriculum might lead to more collaboration among teachers, too. Technology as part of any curriculum initiative — Instead of treating technology as an add-on, let’s make it a central part of any curriculum initiative that we do — even if it is as simple as sharing reflections through a collaborative site after a workshop session. I always want to know what my colleagues have taken away from a session. For example, our Literacy Initiative should have a technology component built right into the planning and into any offerings for our teachers. Professional Reading Groups: It would be helpful if teachers could be encouraged to come together to read articles, books and websites in the form of a reading group/circle. This would allow for more connections among teachers as well as expose more teachers to the developments around technology in education. Ideally, a small stipend would be available for teachers, who would be expected to share out what they learning with colleagues in some fashion. Some recommended books might include: The Digital Writing Workshop by Troy Hicks; The Socially Networked Classroom by William Kist; or Blogs, Wikis, Podcasts and Other Powerful Web Tools for the Classroom by Will Richardson. These groups could be a hybrid of face-to-face meetings and using online sites for discussions. A potential bonus: most of these writers will agree to Skype into reading groups to talk about their books with teachers reading and using them. Maintenance and upgrades of existing equipment must be worked into any long-range planning. It does us no good to push with technology on machines that are broken or antiquated. What am I missing here? Is there something your district does that makes a difference in creating a sense of technology integration? This is a fascinating look at data about the Internet as compiled by Focus, using data from a variety of sources (including the Pew organization). Thanks to Free Tech for Teachers for the link my RSS. Hello. I want to invite you all to join us for this week’s Day in a Sentence, with an alliterative twist. Please boil down your week or a day in your week to a single sentence, but use some fun alliteration with your words. Be creative and be reflective! To participate, just add your alliterative day in a sentence to the comment section of this blog post. I will collect the sentences during the next few days and then release them to the wild on Sunday. I look forward to reading your sentences. Every0ne is invited to participate. Come join the fun. We’re wandering around the world of words this week as we probe the origins of our laughingly liquid English language.